We had a few bouts of torrential rain here over the past week or so, and the farm told us via their weekly email newsletter that some crops didn’t fare well and to expect a little less of some stuff this week. Which, actually, works out quite well for moi. Steve’s away on business for the better part of this week, so it’s me, Aggie, and my trusty glock living it up. Just kidding, robbers, I’m scared of guns. I went to the farm after work today, but not before stopping at home to get the four legged fluff nugget. She is not allowed at the farm, so she just rode down with me–she lurves the car–and stayed in the car while I ran in. Thankfully for me, the greens were a major victim of the rain, so it wad just one basket this time. That’s enough for two dinner-sized salads. Perfect. 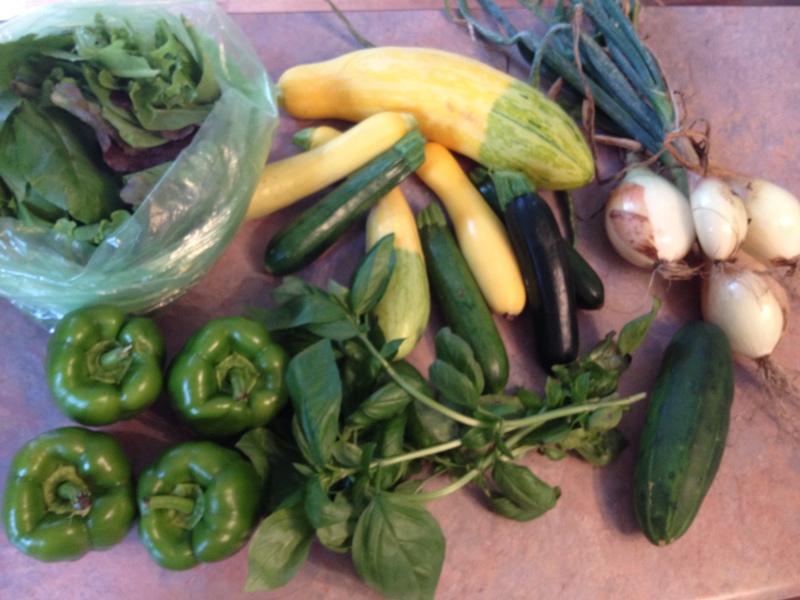 There were cute green bell peppers and summer squash, both green and yellow varieties. I tend to grab the tiny ones, but they had some mega sized ones that were “free” (ie, don’t count toward your weighed amount) so I grabbed a big yellow squash, too. There was basil and onions up for grabs, so I grabbed. I left a few things on the table. Kohlrabi, beets, scallions, and pick your own string beans (the dog was waiting, and PYO can take a while). I just roasted 2 lbs of beets that had been collecting in the back of the fridge for a while, so really, not a single additional beet is welcome in this house for a while. Looking forward to some salads and maybe some stuffed peppers, and I keep seeing good zucchini and summer squash recipes on Pinterest. Hmm. I’ll be sure to report my findings! Come and add your link to this week’s CSA link party when you get a chance…http://inherchucks.com/2012/08/02/whats-in-the-box-37/. Looking forward to seeing you there!